Construction materials – cement, reinforced concrete structures, brick, glass, expanded clay and other materials are produced in harsh conditions. Dustiness and gaseousness is an ordinary thing for industrial site, frequently technical processes are accompanied with high temperature and vibration loads. Cranes, employed in в construction materials industry, should be fitted for operation under such conditions. 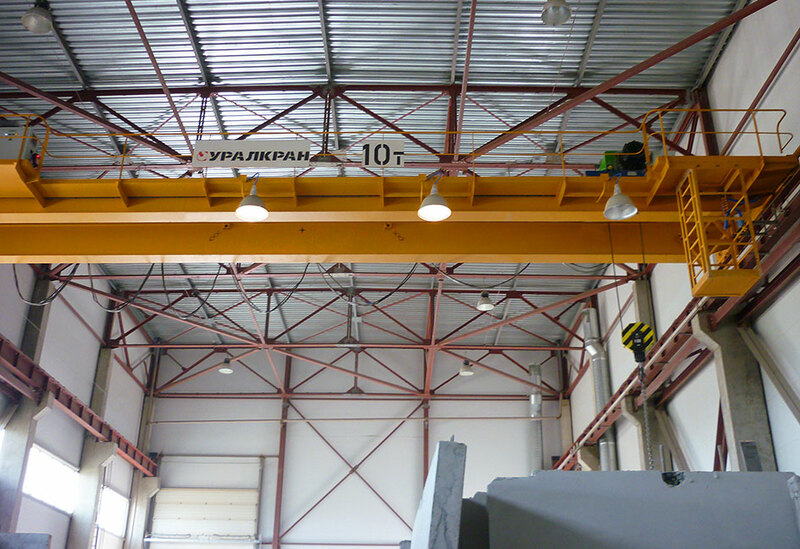 Load-lifting equipment, manufactured by the Group of companies URALKRAN, meet the requirements to the full extent. Design, manufacturing, delivery to the site and assembly of cranes of various types with wide range of speeds, smooth start and stop, gantry and bridge, single- and double-girder, console and light crane systems. Fitting cranes with various weight handling fixtures, necessary in construction materials industry – spreader bars, clamshell buckets, brackets, etc. We adhere to individual approach to each customer – examine peculiarities of the produced construction materials, site configuration and size, other important factors, and select the equipment that matches best in every particular case. We deliver professional after-sales services. Successful track record in the industry: more than 10 years.